My first dive on the Big Island of Hawaii was around 2001. Like a lot of people, I fell in love Kona diving right from the start. Hawaii has spectacular visibility, warm water and if you know where to go, you’ve got a better than average chance of encountering big animals like dolphins, manta rays, eagle rays and even large sharks. This dive site is right on the edge of the town of Kailua-Kona. Get there by driving to down what used to be the runway and park at the end, where you’ll find a little trail to a small beach. It’s close, maybe a hundred feet or so. From there, wade on in, keeping an eye out for loose rocks, urchins and the tide. Once you are a little past knee deep, you can snorkel out beyond the break. If there’s much surf, dive elsewhere. The reef runs both directions. To the left in about 20′ of water there’s a submerged arch. The visibility here is just so-so due to water movement close to shore. As you go deeper, the reef steepens and visibility opens up to 100 feet or more. 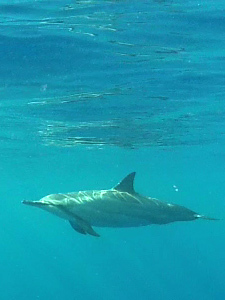 On a typical dive, we’ll swim out pretty much directly from shore to about 80′. Then, we zig-zag our way back to the entry point, keeping an eye out for the arch. So far, we haven’t seen any big animals here, but we often hear whales, and it’s a very nice reef. It’s also just a few minutes from Big Island Divers so we can get fills quickly and be right back in the water. At the other end of the runway, you passed another Kona dive site on the way in. Look for the last house before the beach. There’s dirt parking and a little trail leading over lava rocks to some small coves. If the conditions allow, you can make a fairly easy entry into the largest one, then swim left out around the point and into open water. There are often turtles here. The entry and exit look much more difficult than they are, but you need to time it and stay clear of the rocks. Underwater, you’ll probably hear whales, which will have you believing they’re “just ahead.” They’re probably not, but we can hope, right? There can be a bit of a current here, so dive directly into it to make the return trip easy. Old Kona Airport South is a good dive, but the entry gets blown out quite easily, so we often head to other dive sites where the conditions are more reliable. One of those sites (and my personal favorite) is Crescent Beach. Crescent Beach is located just outside Honokohau Harbor. Sometimes you hear Crescent Beach referred to as ripoff beach because dive boats often take passengers there if the conditions our questionable farther up or down the coast. Nevertheless, it is a great dive site. For starters, we’ve had up-close encounters with dolphins, manta rays, eagle rays, barracudas, large sea turtles and a 20+ foot tiger shark–all at Crescent Beach. Sure, like any dive site, what you see one day, could be completely different the next, but all of these are known residents here. Getting there is easy. Just follow the road until it ends, keeping left around the marina. Suit up here and scramble over the rocks to the beach. The beach has a bit of a break, so time it well and keep to the left. Before going underwater, take a heading toward, or left of the green navigation buoy offshore. I always set a reciprocal relative to that before starting the dive. Drop down and note the wall on left side as you face out to sea in about 10′ of water. This is your best reference for finding a good exit route. Following your heading, the reef starts out gradually, then steepens to about 85′ where it turns to sand. You’ll find garden eels here. On the way out, you may have seen a very large (by that, I mean HUGE) sea turtle, and an equally impressive barracuda at around 40′ near a ledge. I like to hang a little beyond the coral boundary over the sand and look out toward open water for the big stuff. It’s paid off many times. This is where you have a better than average chance of seeing dolphins, manta rays and eagle rays, as well as at least one very large tiger shark. Locals tell us there are several big tiger sharks here. Somewhere in a neighborhood South of Kailua-Kona is a beach called Black Pebble Beach. For directions, you’ll have to beg the locals because I don’t remember the turnoff. We discovered this dive on our 2014 trip and it is a universal favorite. You park at the end of a street where there’s a beautiful beach made up of black gravel. It’s pretty steep, which reminded me a lot of our own Hurricane Bay up at Lake Tahoe… only warm, and a lot more to see. The reef runs to the North and is made of of rocky ledges, channels and valleys. At one point there’s a sheer wall with a single crack running from the sand to the top around 30′ or more. A huge moray eel calls the crack home. I can’t provide much detail since I’ve only done this dive once about 8 months ago, but this is truly a great Kona shore dive. I think the locals tend to keep it a secret, so you might have to take a blood oath before anyone will tell you how to get there. It’s very pristine too, so if you do go, be cool to the residents, and keep it clean. I think Two Steps goes by a number of names (Honaunau Bay is one of them). It is super popular with snorkelers because of easy access and a spectacular reef with 100+ feet visibility. To get there, take a right down a narrow, one way road just before the entrance to Place of Refuge State Park. Try to find someplace to park among the hoards of beach goers. The dive site is named for a couple ledges (2 steps) that make entry and exit pretty easy. There can be a bit of surge, so timing is key. Also, keep your fingers out of the holes in the rocks, no matter how tempted you are to use them to hold on. They’re all full of urchins, so use your palms, keeping them flat. Gloves aren’t a bad idea either, but not entirely necessary. The dive runs anywhere straight out along the shore. We usually go left, since this is the steeper side of the reef. At about 40′ you’ll find a channel running straight down (not quite vertical) to about 90′ where the reef ends in the sand. Large eagle rays are not uncommon here. A multi-level dive plan works well here, as with most Hawaii dives. We’ll generally bomb the channel to 90′ and head left until we get to within a few minutes of our NDL. Then, ascend 20′ or so and continue in 20′ increments until we hit our planned turn pressure. At that point, we just make our way back, being careful to stay out of deco. Miloli’i is another on of those “secret” dives. It’s pretty far down the coast, so we’ve learned to pack a lunch and bring multiple tanks. The dive is really more than one dive, depending what direction you choose. That’s pretty much the story with most Kona shore dives. North, the reef runs through many channels out to about 90′ or more. It’s easy to lose track of where you are, so pay close attention to your compass. The reef is very pristine, and the entry is probably the easiest of all our ‘regular’ dives. There’s no surf, and aside from some loose rocks, the hardest thing about it is that it’s shallow, which makes stepping through all that a pain with your gear on. To the South, you’ll find a series of “mini reefs” surrounded by sand. It’s fun to swim around them, keeping an eye out for eels and other marine life tucked into the coral heads. If there’s one dive that typifies the Kona diving experience, it’s the manta ray night dive. The most popular, and by far, easiest way to dive with manta rays in Kona, is to book the dive with a commercial operator like Jack’s Diving Locker. I strongly recommend anyone who isn’t fit and absolutely comfortable with long surface swims, rough entries through urchin-infested lava, significant surge and boat traffic… at night, opt for the commercial dive boat option. That said, I’ve done this dive many times, and with solid skills and planning, it’s truly spectacular. You begin by parking and gearing up in the Sheraton parking lot, and making your way over to the harbor near where the hotel conducts weddings. At that point, you’ll see several places that look like you can make a decent entry, but none that are great. Choose one, and when the surge comes up, take the plunge and quickly swim away from the rocks. Once everybody’s in, start swimming toward the point, but well away from the rocks. There will be waves crashing into them. It gets shallow there, so you’ll take a beating if you get sucked into that mess. If it’s dusk, there will already be 2 to 3 dive boats with scuba divers, snorkelers, and dozens of lights in the water. There are two manta ray night dive sites in Kona. Most of the dive boats go to the other, which around the airport. Once you are within say, 100 feet of the dive boats, take a compass heading and descend. You’ll probably see the lights and general mayhem surrounding the boat activities. Swim toward it. Most often, manta rays make their entrance early on, so you’ll probably see them right away. Stay well away from group divers brought on commercial dive boats. It’s hard enough keeping divers safe and accounted for during the day. Mixing in with them makes it very difficult for divemasters to keep track of their own. Bring the brightest light you can find. 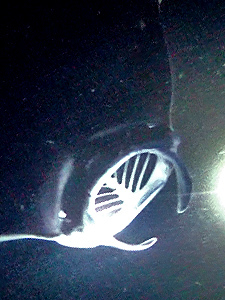 Bright lights attract the most krill, which in turn, attracts manta rays. I’ve literally been able to guide manta rays to me by having the brightest light. Don’t touch the manta rays. Please, just don’t. They may bump into you, but the manta night dive is a hands-off activity. It may even be illegal to touch them in Hawaii, but I’m not sure. Either way, you’ll look like a tool. Keep light on at the surface. This is an active harbor, so there may be significant boat traffic. Be as visible as possible all the time. Have surface support at the exit. You’ll add a huge margin a safety, and make the entry/exit MUCH easier by having one or more people on dry land providing light and assisting with equipment. In fact, that’s the only way I’ll conduct the dive nowadays. It is worth mentioning that almost every dive boat operator will pull you off the manta rays within about half an hour. Our dive typically go 75 minutes or more, with half the tank left over. The best part of this dive comes after the dive boats depart, leaving just us with these amazing animals. To me, the experience is worth the added effort and risk, but take a hard look at your personal diving skills and level of fitness before jumping in. If you have any doubt about your ability, stick with Jack’s. These are just a few shore dives in Kona. I hope you’ll forgive the lack of detail, but I’m doing this for memory. Feel free to drop me an email, or comment below if you have questions. Aloha!